Happy Friday! I am looking forward to a relaxing weekend. What are you guys doing this weekend? While you think about it, let me share what pretty things caught my fancy this week! Everyday I'm Hustlin' T-shirt I mean... the letters are glittery! So perfect! Gelous Nail Gel Coat Why not give it a try? If it doesn't work, it was only $5.99! Love Tank Again with the glitter... gets me every time! 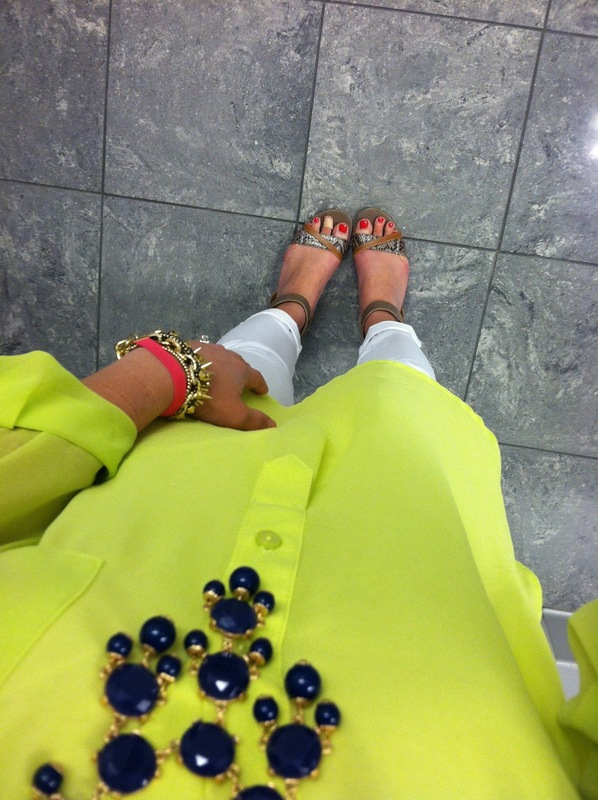 Green Zara Sandals Who doesn't need a pair of statement shoes? Swimsuit top and bottom Totally in LOVE with this print and style! What made it on your wish list this week? 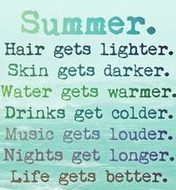 I saw this on an iPhone case and it describes the way I feel about summer to a T.
Summer is in full swing! Can you believe the month of June is coming to an end? 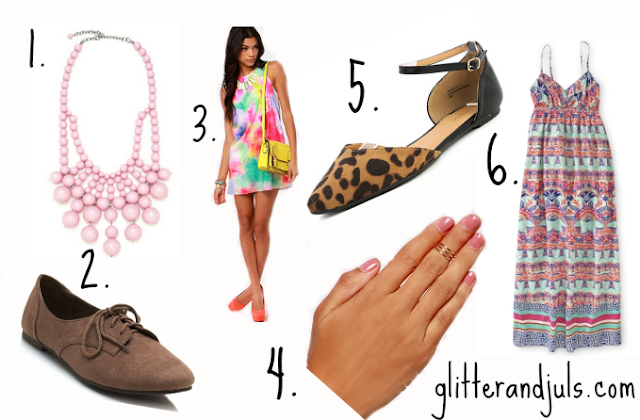 So in the spirit, I thought I would share with you a few of my favorite items in the summer! 1. First, let's talk about how wonderful maxi dresses are. I live in Georgia where it gets super hot and humid. The last thing you want is your clothes sticking to you. 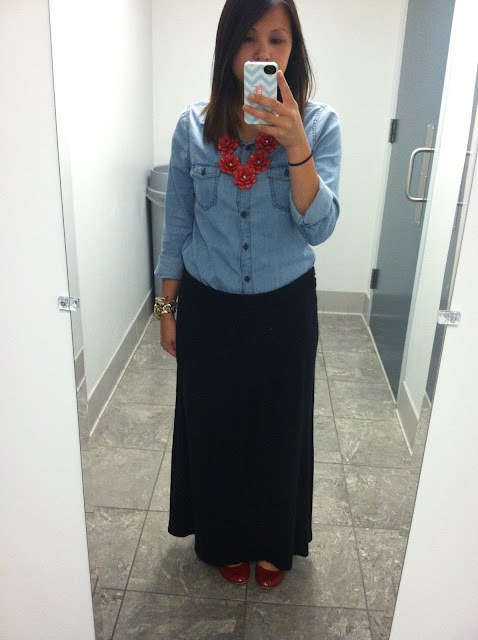 Maxi dresses are light, comfortable and fashionable! 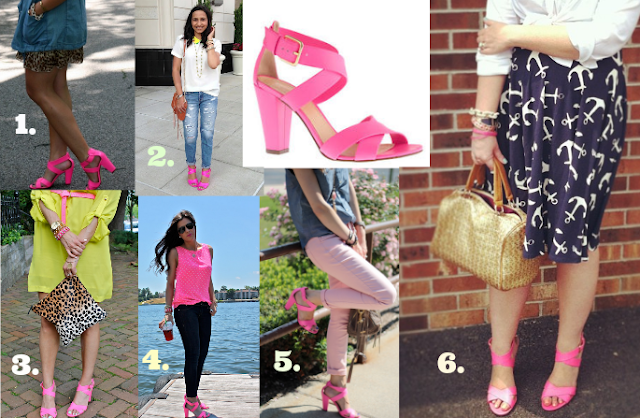 You can dress them up with a cute pair of wedges or dress them down in flip-flops or sandals. Its a easy choice when you can't find something to wear. 2. When I go to the beach or pool I don't like wearing my nice glasses. It is bound to get wet, scratched, lost or broken somehow. I learned my lesson in middle school when I borrowed my sister's Oakley's to go swim in the river with friends. My friend pushed me off the dock and there went the glasses in the water never to be seen again! My sister was not very happy with me. So I like to buy fun, cheap, and colorful glasses for such occasions. 3. 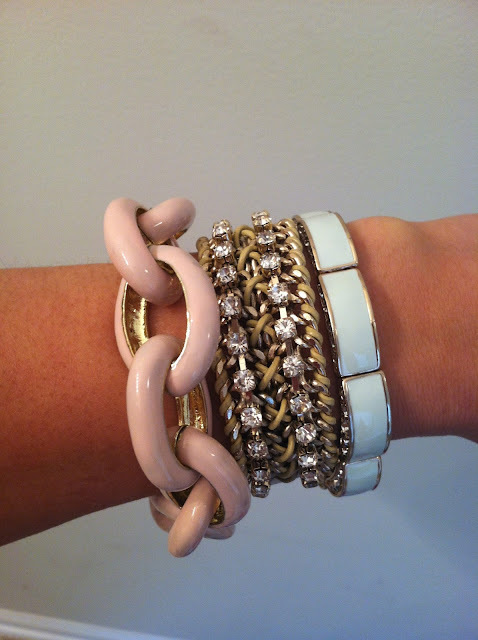 Some beauty essentials that really go a long way in the summer are a good blush/bronzer, lip balms, and fun polishes! I got to try this Hot Mama blush because it came in my Birchbox. I really liked it because it was a great shade and doubled as a shadow! 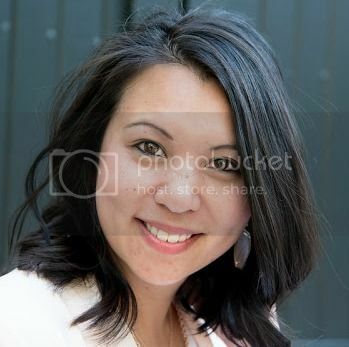 It was perfect for highlighting cheek bones and really gives you a summer glow. I have been through many lip balms and this one from Maybeline is my absolute favorite. It leaves your lips really smooth and I like the green one because its a little minty. They come in fun flavors and tints too! Lastly of this group is playing nail polishes. It is a MUST to maintain a nice pedicure and manicure during the summer. Your piggies are constantly in open toe shoes and who wants to see a jacked up pedicure. 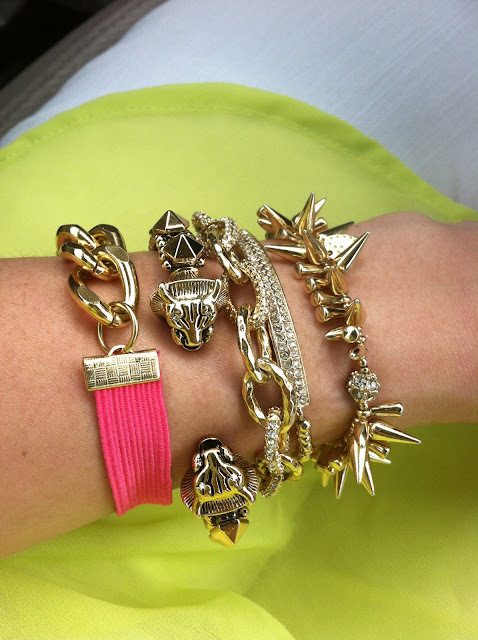 I love bright colors in the summer and neon has really become a favorite! 4. I have a thing for glitter (hence, Glitter and Juls? ;) ) These glitter sandals are the infamous Instagram ones that have become so popular. I don't own them but I like how versatile they are and really make any outfit pop! I think sandals in general are essential during the summer. Who wants to wear socks and tennis shoes in the heat? 5. Lastly, the next summer uniform besides maxi dresses would have to be a classic pair of denim shorts and a graphic tee. Nautical tees are fun for summer and I have this thing for sea horses lately. I also love flamingos, floral prints, and anything beachy themed. 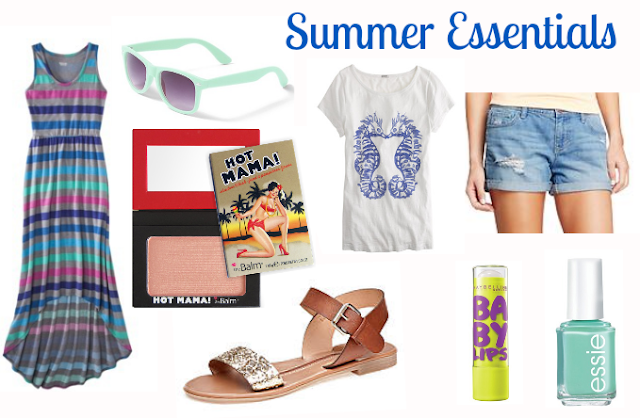 What are your summer essentials? Anything I should try this summer? I'd love to hear your favorites and try a few out! Friday! It's finally here! And I'm in love. Shocker. Happy Wednesday! I am super excited because that means I only have two more days until my week long vacation begins! I won't be taking any infamous bathroom shots so you'll be getting another view next week but this is how my work outfits and a couple of weekend outfits panned out! This week's coast to coast challenge on IG was "sporty chic". I would have never put this combination together if it weren't for the challenge but I loved how it came out. Who knew I could sneak to work wearing the most comfortable tee I own! I was playing with different patterns with this ensemble. Polka dot and stripes! Polka dots and lavender! 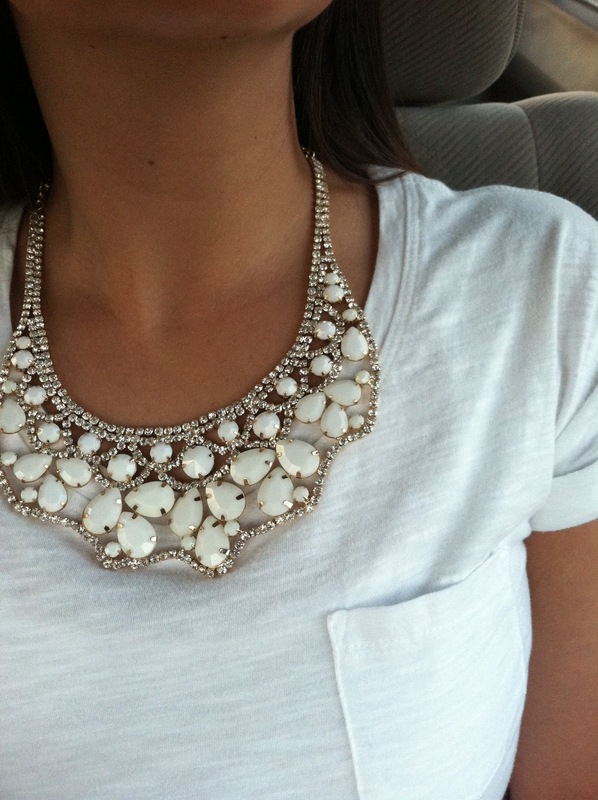 I love how the necklace brought this piece together! I love both of these flats! They are both from Make Me Chic and both we each under $20 bucks. You can't beat those prices! 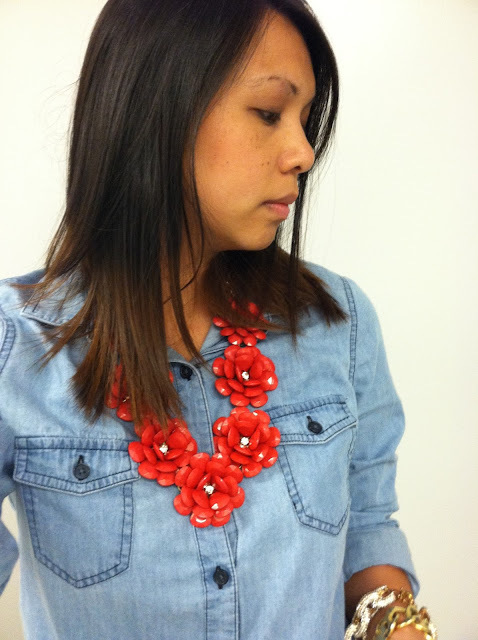 And of course I have to add a statement necklace to add some fun to both outfits! As usual, there is always something on my current want list. Let me share this week's list with you! Like any of these? What's on your list? I discovered the Coast To Coast Challenge hashtag Instagram phenomena as I was wandering other IGer's feeds one day and I loved the idea. It was a fun way to be inspired! I've been able to join in on many challenges and I enjoy looking through everyone else's interpretation on for each theme. 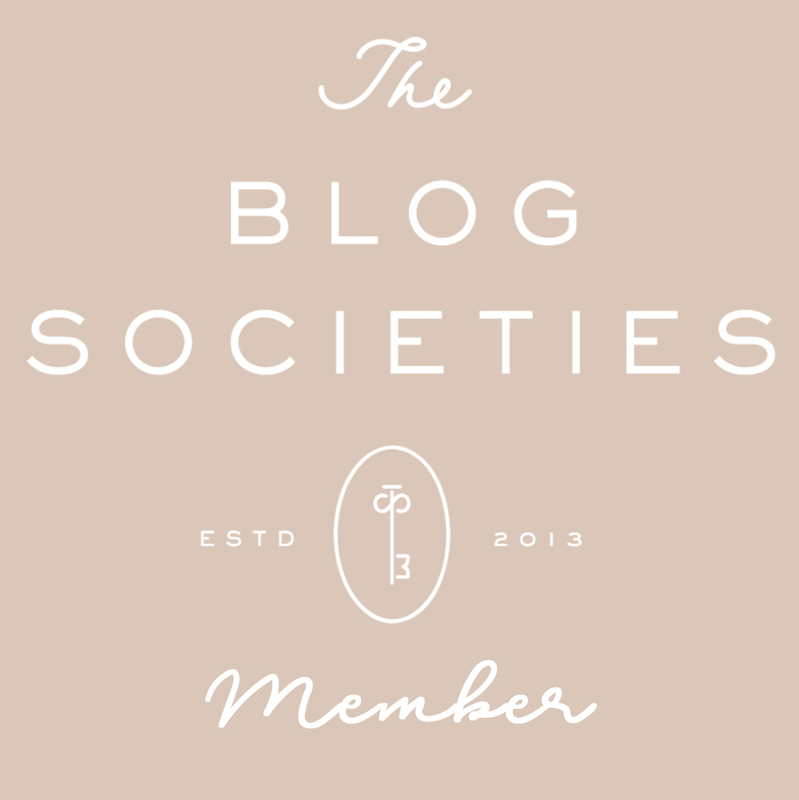 I soon discovered the blog behind the social media trend and have started following many of the contributors. One of the challenges this week was "White on White". Below was my interpretation for this fun summer trend. I glammed up a simple white tee with a white jeweled bib necklace. For each challenge there is always a post on The Coast to Coast Challenge's blog on IG inspiration for each of the different challenges.. and guess who's photo made the post? Yay! And go find about more about the Coast to Coast Challenge here! 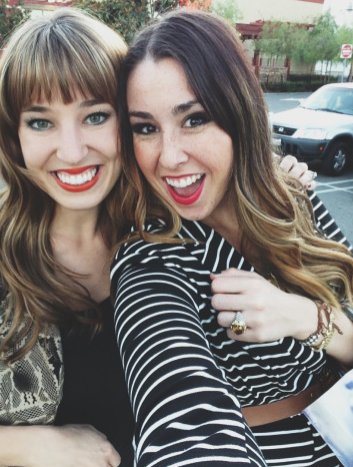 You'll learn how this fun social media trend was born and the lovely ladies behind it! Welcome to a new wiww post! This is a place where every day women find inspiration for new outfits! There are a lot of blogs that have great outfits but the price tags on some of the outfits are out of my price range. I have realized I don't need to spend a lot to look great and feel great. This is how my week worked out. 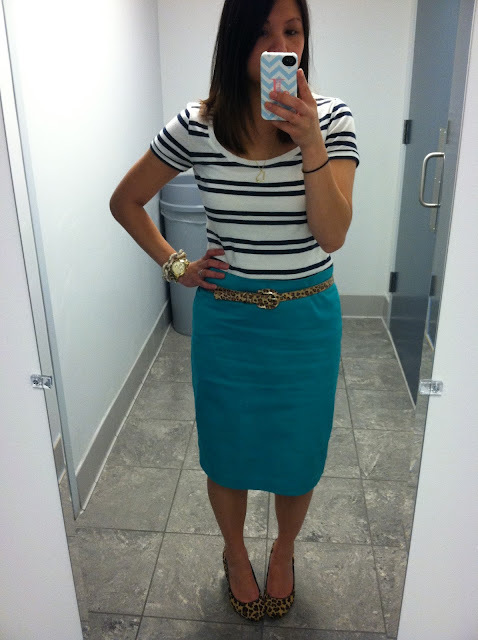 Sometimes I feel blah about a few of my outfits, but I loved all of them this week. I enjoyed playing with colors! 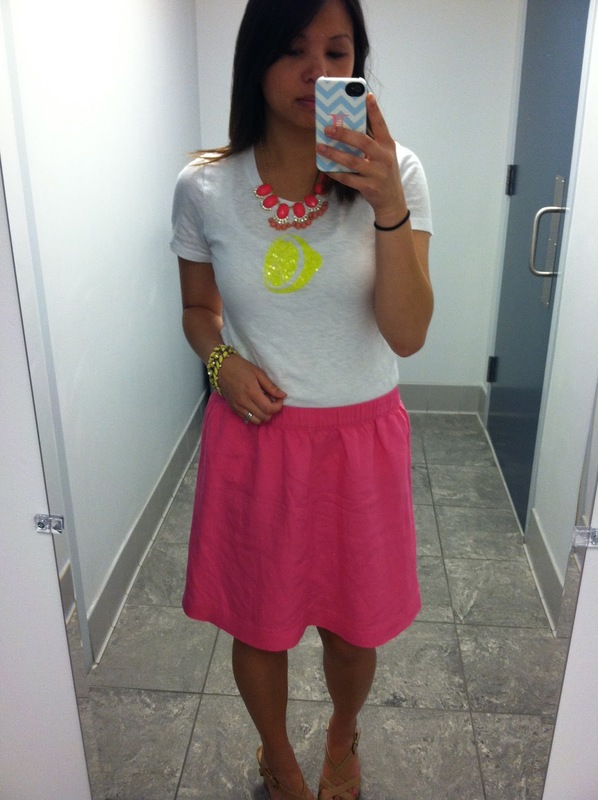 This skirt and shirt were clearance finds from outlet shopping over memorial day weekend. I feel great when I find deals like this. I am the master bargain shopper! The leopard details really brought this outfit to the next level! Love it. The color of this shirt is such a fun vibrant color and the material is so light weight. It's perfect for the summer! This is probably my favorite of them all. 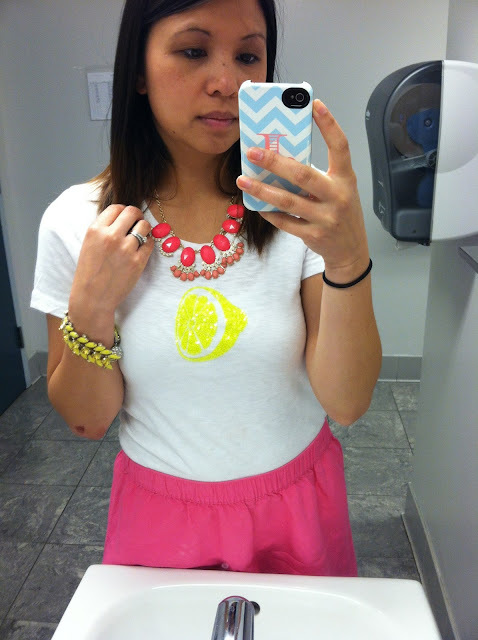 This lemon t-shirt is adorable and so was it's price tag. This was yet another clearance find during the holiday weekend at the J Crew Factory store. I shall call her Pink Lemonade! 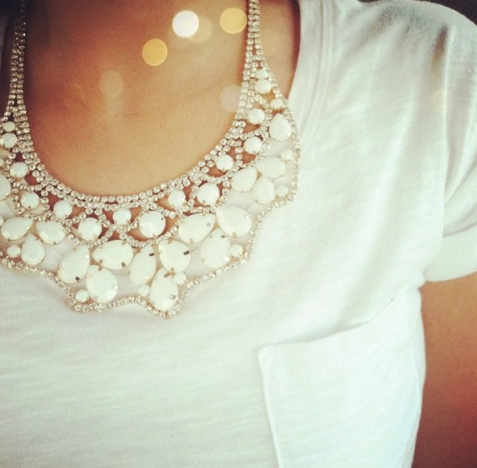 In a previous post (here) I wrote about how popular this necklace is among Instagram. It is way more versatile than I thought it would be and I love finding new ways to wear it. 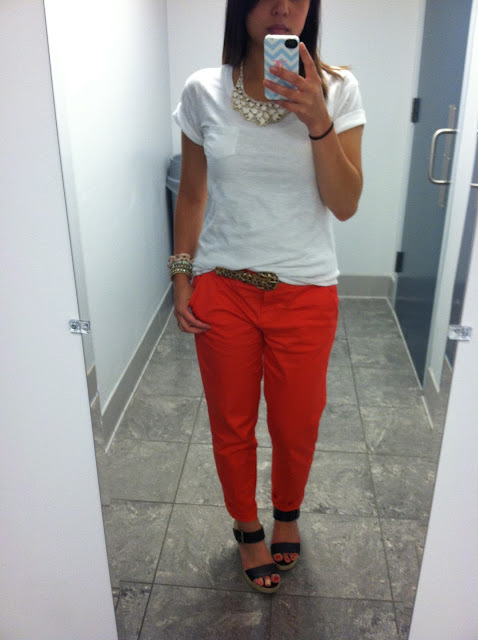 Um, this girl did some serious outlet shopping and these coral pants are another fun find from the holiday weekend! I love the color and they are so comfy.